Today we are Providing you some Quizzes based on New Words from The Hindu word lists. 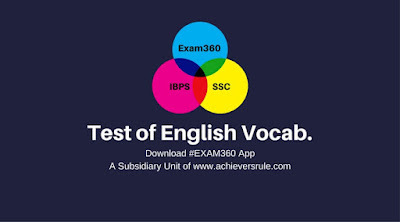 You can solve the English Vocabulary Test/Quiz on a regular basis from Achiever's Rule. These questions are very important for various Competitive Govt. Exams like SSC CGL, CHSL, SBI, IBPS and Other Banking & Railway Exams. You must follow the Current Affairs Update, Daily Current Affairs Quizzes, One Liners, Banking Articles to complete your preparation process. Direction(Q1-Q15): Choose the Word Meaning Similar to following Words given in the below Options. These Questions were purely based on Previous Years Paper of SSC & Bank Exams. It will definitely help you to grow your english skills.